Up for sale we have a real treat for you. This is a 1968 Chevy Camaro RS Pro Touring. This ride is at the top of the food chain. It has recently just underwent a complete resto with over $100k spent on the drivetrain alone. There is nothing missing on this gorgeous ride. Pictures, Videos, and Words will never do it justice. We have a DVD with pictures of the resto along with Receipts showing the work done on the drivetrain. The body is laser straight with great lines and great fit. This was a solid car to start with and then it was taken all apart and restored. All the metal is good as well as the floors. The Medium Silvery Poly paint is slick with a deep rich shine. It has had hours spent buffing and polishing and when you look in the jams they look good as well as under the hood and in the trunk. The paint is set apart by the graphics on the Rear spoiler that tell you all you need to know about this ride. At the time of the resto they replaced the bumpers as well as other chrome. It has a new RS Grill and Headlight doors. When you look at the glass and stainless it all looks very good. They also installed new weather stripping and seals. The final exterior touch is the 18” and 20” Billet Specialties. On the inside it's done in leather with the front buckets being out of a Vette, they are power and they do work. Before the carpet was put in the floor was covered with Dyno mat to keep the heat out. The shifter is by Winters and all the gauges are form Auto Meter. So that the car could handle the power they added a cage form S&W. 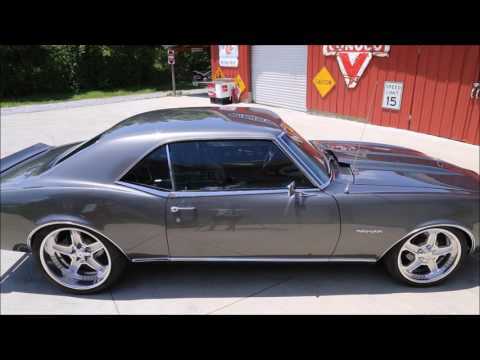 The inside of this Camaro is very clean, neat, and top of the line. It has Vintage Heat and AC as well as a top of the line Stereo System. Under the hood it has a 6.0 Medium Boost Injected 373 with a Pro Charger with Inter Cooler. This engine has a list of High End parts that can't all be listed here. Some are the Dart Heads, Edelbrock Intake, 90MM Throttle Body, Comp Cam, Comp Roller Rockers. Also it has S&S Headers with Stainless Exhaust. The trans is a built 400 Turbo TCI Converter mated to a Strange 9” Rear end. The rear suspension is by DSE that is a 4 Link with Coil Overs. The Brakes are by WilWood on all four corners and they are Power. To keep this ride cool it has a Radiator form AFCO and the wiring is from SSP. When you look at the floors they are great with Frame connectors tying it all together. This is a car that you can drive every day or take to the track and play. As we said words will never do it justice and I'm sure there is something we have left out. We are advertising it as an RS Clone. If we can help you in any way with questions or a specific picture, you can call our office at (865)988-8088. Or feel free to call Daniel at (423) 807 0600, Devvin at (865) 256 2366, or you can e-mail us at sales@smtclassics.com.